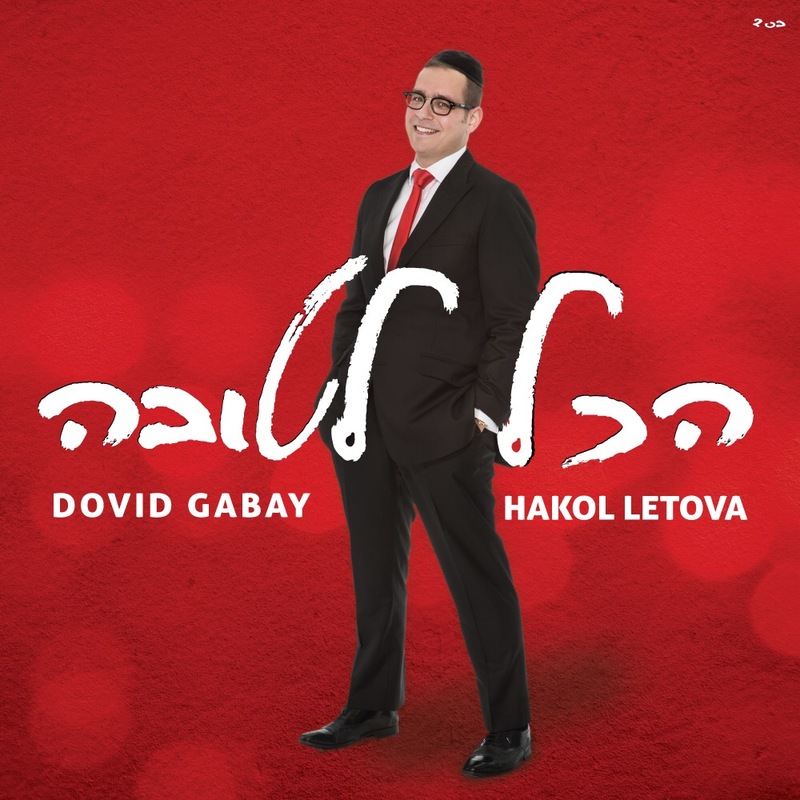 Full disclosure: This article is not—I repeat, NOT—an objective review of Dovid Gabay’s newest album, Hakol Letova. That would be impossible for me, given that we were classmates for four years, in the yeshiva band together, and played multiple gigs together in each other’s communities over the years. And, as anyone who knows me will tell you, I am not shy about shamelessly name-dropping Dovid’s name into any conversation about Jewish music—whether I deserve to or not. After the release of Hakol Letova, I asked Dovid if he would be willing to talk about the new album, and he graciously obliged. You, lucky reader, get to eavesdrop on our conversation. My sincere thanks to Dovid for taking the time out of his busy schedule to catch up with an old friend, and I hope that he sees much success with the new album. What follows below has been lightly edited for content and clarity, and any notes I added into the transcript appear in brackets. Shimon Simpson: First and foremost: It’s been a while! Five years or so since your last album, Eretz Yisroel--what have you been up to? You know, besides for a new baby, making a bar mitzvah, and a new album all in the last year? SS: You are listed as the “Executive Producer” in the liner notes–did that title come with extra responsibility or creative license? DG: This album was actually co-produced by CD Eichler (AKA Pella) and Sruly Meyer (Benny Friedman). They did a fantastic job throughout, and the song picking process was very efficient because I had three opinions (including myself) all from different musical and ethnic backgrounds, and we felt if there is a song that appealed to all three of us, then we had a winner. Based on the early feedback from consumers who have bought the album, it seems that they agree that the material on this album is great! My role was definitely proactive in production and decision making, but at the same time taking a step back and hear out Sruly and CD’s suggestions and ideas. We ended up implementing some of everyone’s flavor. They played a heavy role in facilitating different facets of the album, whether it was speaking to the arrangers, getting compositions from composers, or even arranging meetings with composers for me to meet with. SS: Getting to the album itself, which song speaks to you most? DG: It’s a bit cliché to say this, but it’s my personal feeling. My kids have asked me that question and my answer is that every song represents a different mood, message, arrangements, lyrics, etc.… So they all serve a different purpose. It’s a little like asking the president of a country “Which one do you like better… The navy, army, or air force?” They are all there for different reasons. Each song on this album really delivers an entirely different flavor. Some are meant to make you dance, some are there to make you cry, and some are there to make you think and reflect…. SS: Could you elaborate on a couple of tracks and the message they are attempting to convey? “Hakol Letova” [Track 1] has a very positive upbeat musical arrangement. The exact same feeling you’re supposed to have when internalizing the words “Hakol Letova” – Everything is for the best. Those are super positive words. I’ve already heard a story this past Chol Hamoed Sukkos about a family driving in from Lakewood to Brooklyn for a Simcha, and they were having car trouble and wondering if they were going to make it all the way in to Brooklyn. They had the CD in the car, and the father kept replaying the song “Hakol Letova” over and over again to drill in the message and hear the mussar ;). So I do think that people can, and indeed will, internalize the messages here on this album. “Shir Ha’achdut” [Track 2] is another example of how the emotion of the music matches the lyrics. This song was composed in memory of the 3 Jewish youths that were murdered a”h last summer which sparked a war that lasted for months in Israel. I can actually feel that emotion in the melody when I sing it. When I’m singing it now, I’m thinking of the attacks that our brothers and sisters are undergoing right now all over Israel, and the message is clear that we don’t understand why this is all happening, but one thing is clear… We stand united around the world for our brothers and sisters davening for them 3 times a day, and we will believe in only the One Above and wait patiently for Moshiach! Powerful message. Powerful lyrics. SS: What was the artistic process of the song “Hakol Letova”? Did the song come to you fully formed from the minds of Miriam Israeli and Mordechai Brezel or did you have input as the song evolved? DG: Mordechai, a talented new young composer, who, I believe, we will be hearing more from, came with the basic composition, and Miriam Israeli was able to contribute her linguistic talents as she has in the past for our Jewish music market. They both came through big time on this track. However, it would be wrong not to include Yoni Eliav, the arranger of the song, because I feel that all three of them contributed huge parts to the success of the final sound of the song that you are now hearing. DG: Wasting time should not be taken lightly. As a bachur you could hear that over and over again, but most people won’t be able to internalize that message until they mature later on in life, when they have more responsibility. It’s an extremely relevant topic these days, maybe more than ever. With all the gadgets, apps, and distractions in our generation that sometimes seem necessary and even important, they can really pull us away from what may actually be much more important. The message of the song is NOT that money is a bad thing. The main message of the song is that money isn’t the ONLY thing. It’s OK to go out and make a living to support your family, but remember that that is the reason why you are making a living… for your family. People get so caught up in work related email exchanges trying to close deals, and that’s ok, but our chachomim’s advice is not to be too extreme. Enjoy your family. Enjoy your learning, and focus on connecting to the One Above. SS: I noticed that the ten songs on the album are by ten different composers. Am I correct in assuming that was by design? Related: do you believe that you need to use well-known composers to put out a successful album? DG: The song picking process…is the most crucial part of the album production process. There were hundreds upon hundreds of compositions that were reviewed, sometimes re-reviewed. It just so happens to be that it came out to be that way. On this album, no composer had more than one composition…. That is actually a first for me. In the past I always had at least 2 compositions from one composer. In fact, I’ve taken 5 or even 6 songs from one single composer in the past. In regards to the second half of your question, I definitely do NOT believe in name recognition when it comes to compositions. On the consumer’s end, they may buy an album if it says it contains songs by certain composers (and that’s great), but if there isn’t anything special about that composition, it brings no value whatsoever to the artist other than the fact that he sold one single copy based on the composer’s name. That’s not what I strive for as an artist. I’m looking for the big picture. To satisfy my listeners and followers. I want to bring a great listening experience to my fan base, and if that’s through a composition created by a less known composer, so be it. SS: Who have you not performed with yet who you would love to (if anyone)? DG: I think I have more or less performed with everyone in our American market. There are some Israeli performers that I would like to one day perform with like Chaim Yisrael and Aron Razel. SS: What is your favorite style to sing (“Jewish” is not an answer)? DG: Second Dance material. I think you can tell that by this album’s song selection. Also, if there is a nice open note ballad that brings out the pureness of your neshama, I love to sing those as well. Songs like Eitan Katz’s “L’maancha”. That really speaks to me. That is what Jewish music is all about. Connecting to Hashem through the intermediary of melody. That, I believe, is what you find by the song Hamalach here on my new album. Open notes, very singable. DG: Everyone knows Shlomi is the man!! He’s been playing on my albums since Legabay! SS: Would you encourage your own kids to go into music? DG: I certainly encourage my kids to know music, the theory behind it. Chords, rhythm, etc.… It’s a great, unbelievable outlet for anyone willing to explore it and patient and driven enough to learn and master it. Some of [my kids] already play instruments. SS: Speaking of kids–let’s plug your child soloist, Simcha Schachter. Where did you pick him up from? And where can we hear more of him? DG: I needed a child soloist, so I called none other than Eli Gerstner. He made the shidduch. I was very happy to have Simcha join me on [“Hamalach”]. Simcha is actually making quite a name for himself with the Yeshiva Boys Choir, earning himself some solos there. I saw him perform live this past Sukkos for the first time when I did a surprise appearance at the YBC show in Englewood, NJ. A very unassuming boy. Wishing him much Hatzlacha going forward!! SS: What would you like to do artistically which you haven’t done yet? DG: That is a great question! I play keyboard and piano and understand music theory to a certain degree… I would love to compose, arrange, and create my own music one day from beginning to end. That is something I’d love to do. I edited my own vocals on this project and it was a great experience for me. I hope to move on to more post production involvement for the next album, IY”H. SS: What do you love about the Jewish music industry? On a related note, if you could change one thing about Jewish music, what would it be? SS: What funny/interesting/crazy stories or tidbits from the production of the album can you share with us? SS: Any final words for your fans? DG: It was worth the wait. Buy this album. Enjoy this album! There’s a lot of great stuff here to listen to. Looking forward to seeing you all at my upcoming shows. L’shana Haba’ah B’Yerushalayim!! Ding ding ding!!!!! We have a winner! If you had “33 1/2 hours” as your bet for “How long will this post be up before someone figures out that Shimon stole the title from Matthew Berry”, please come to the bandstand to claim your prize!